I have been asked countless times about when I’m going to write a book about writing a book. It’s something that was close to Bryce Courtenay’s heart that I tackle this task and in forcing me to take on the masterclass, he also pushed me harder with the practical guide to storytelling that I was pottering with. He insisted on having the final say too, as you will see from his remark. Anyway, the point of this is not to big note myself or to suggest that I know all there is to know about writing novels. Quite the contrary, it’s everything I personally have acquired to this point about the creative side of the craft. I think it’s important to accept that we never stop learning. It is my intent that every novel I write is better than the last. That doesn’t necessarily equate to it being more popular than the last or that it outsells its predecessor (although that trend is highly desirable). No, my intention is that technically I improve with each new release. And by that I mean I aim to bolt the story together more fluidly, that the words follow one another in an even more pleasing rhythm, that the chapters connect more seamlessly, that the characters have more depth and development, that the story packs an entertaining wallop so I never let down my readers, that the plot is intriguing, that the cast is engaging, that the storytelling itself has more grace, more finesse, more oomph! And so it goes. I want everything about the delivery of the latest story to be better than the last one. If we accept that improvement is a natural progression with each novel then it’s fair to say that I keep learning and thus the practical guide is everything I had acquired and could offer up to March 2015 when I signed it over for publication. No doubt by the end of this year with two more novels under my belt, I may have acquired some new skills. In fact, most certainly I have because the Christmas 2015 novel is written in the most intimate point of view of first person. That’s a first for me. I have always lurked happily with the omnipotent third person perspective but this imprisonment in the mind of one character offered up an array of challenges for me that I enjoyed tackling. I’ll let readers be the judge of my ability in this first person pov but my editor is very happy and that makes me happy. This guide – and that’s all I claim it to be – is a practical tool to help new writers acquire some confidence and a pathway forward on the journey of their commercial fiction novel, and it cannot replace the masterclass. There is something magical about masterclass; something spiritual if you must, certainly ethereal that swirls around the cohorts and not only binds them but propels them in the right direction. You only have to ask a masterclasser to discover the effect that this week has on their positivity, productivity and their sense of potential within. The bootcamp nature of me in your face each day getting the very best out of you – even if you’re an absolute beginner, can’t be compared to reading a book at home, alone and drawing wisdom from it. How to Write Your Blockbuster will, however, set you up in a practical manner, for success. It will force you to confront the isolating pastime and mammoth journey of your first commercial fiction novel but with a firm sense of hands behind your back, shoving you forward and whispering encouragement. It is going to be a helpful companion to writers who cannot get to masterclass for one reason or another. And although, unlike masterclass, it cannot give you that one-on-one, or answer your questions, or show you aspects of your writing that could be improved in various ways, it will add structure to your time at the keyboard and enable you to appreciate that you can go the distance. Its aim is to accompany you on the journey and to assure you that many have trod this path before and you have little to fear except a lack of imaginative storytelling. It’s written in plain, user friendly style and tries not to get above itself. I do think beginners will get the best out of themselves with a guide like this to consult but even for writers a little further into their journey, it may just trigger the optimism or determination you’ve been searching for. 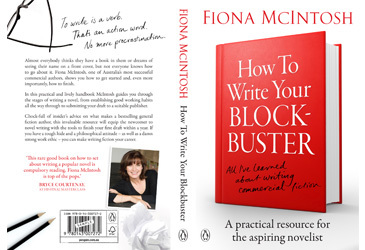 I do hope this new book helps somewhere on your commercial fiction journey and if you need something a bit more hands-on, I’ll be waiting for you in masterclass. Your book sounds really helpful Fiona. I am looking forward to reading it when it is released. Thank you Delores .. it will be a creatively helpful, objective and, I hope, confidence-building read. I have my sticky notes and highlighter ready. I am looking forward to devouring this book and learning everything I can from the Master Storyteller. Oh my pleasure. It will be a helpful starting point for anyone new to commercial fiction. Thank you for looking forward to it. Thank you, Alex, very kind and always thrilled to hear from a happy reader. Like Alex I’m here to say I love your books and when I cannot get one here I ask my daughter in law to get it for me in New Zealand. I can see I am going to have to give in and eventually buy an ebook or a kindle. More strength to you for more writing. Enjoying reading it very much. I recall seeing Bryce Courtney interviewed on This Is Your Life. Asked about how he succeeded in writing, his answer, was, with apology, “Bottom glue”. The ability to sit down for an allotted time and write. Your book says it slightly less personally, but just as firmly!